RIGHT FABRICATION was registered in 2009 as a partnership specialising in stainless steel products that was in demand by hawkers, shops, restaurants and also private dwellings. RIGHT FABRICATION manufactures all kinds of stainless steel equipment that caters to the needs of factories, hotels, supermarkets, departmental stores, hypermarkets, oil and gas topside and also residential properties. Under the strict supervision and guidance of En. 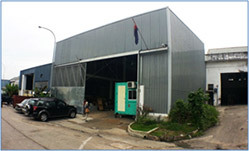 Zahri Bin Edin and Mr. Len Tin Khoon, RIGHT FABRICATION has proven to be reputable for fine workmanship, quality products and in-time delivery to customers. We have a team of skilled, dedicated and efficient personnel to serve customers at their best capability. RIGHT FABRICATION is confident in the work and ability to establish strong, enduring relationships with customers and partners well into the future.